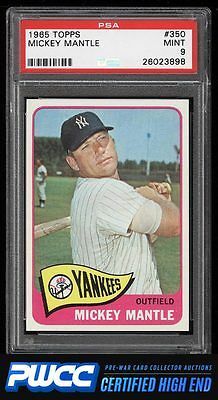 Hands down the single finest '65 Mantle we've brokered in our history and may be the finest PSA 9 in the entire hobby. A shockingly fresh and perfectly printed example with four flawless corners, chipless edges, and bright white borders throughout. My goodness this card is pretty and is worthy of the finest collection. One of nearly 20,000 cards, lots, and sets up for bid in our 7th Auction of 2016. Click on the link above to view the other PWCC auction lots.